Newborns spend 98% of the time nursing, and sleeping huddled together for warmth. Newborn puppies cannot regulate their body temperature, so it’s is essential to keep their environment at the proper temperature or else the puppies can become very sick or even die within a short time. ALL puppies are born blind and deaf. At this age, they rely 100% on their mom to keep them clean and lick their privates to stimulate them to go potty. Puppies usually open their eyes around 10 – 14 days old. When their eyes first open, they have a protective glaze over them, so when you look at the puppies eyes, they can appear foggy. This is normal and will usually go away within a few days. Their ears start to open around the same time as well and will begin to react to sound and light. Their noses and pads are usually pink and turn black or liver (chocolate) later. The legs on newborns are fragile, so all they can do for the first two weeks is wiggle around. 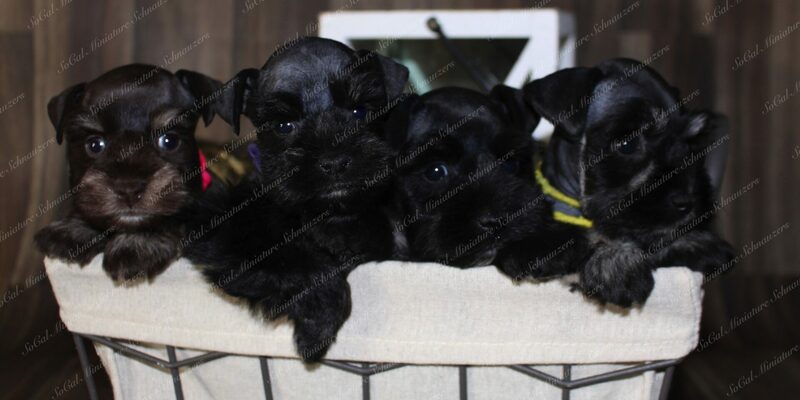 Like the majority of breeds, Schnauzer puppies get their tails docked and dewclaws removed at 2- 3 days old while their cartilage is still very soft. If it were to be done at a later date once the cartilage calcified into hard bone the procedure would turn into a very expensive, painful, and much more involved amputation surgery. Both experience and research have shown the beneficial effects that can be achieved from early neurological stimulation, socialization and enrichment exercises. Each has been used to improve performance and to explain the differences that occur between individuals, their overall trainability, health, and potential. The increasing effects of the three stages have been well documented. Each has a cumulative effect and contributes to the development and the potential for individual performance. At this age, the majority of there time is still spent eating and sleeping. Although, when puppies are awake, they begin to socialize and learn how to use their legs by trying to stand, sit and even walk during these two weeks. It’s rather fun to watch them during this stage because they are still very wobbly and fall a lot like they are tipsy, it's quite cute if you ask me. At this development point, they are still 100% dependent on the mom's milk to keep them alive but at 4 weeks of age, we introduce them to gruel/canned food to begin the weaning process. At this time, the puppies can see/hear clearly and are beginning to walk better. At this age, it is common for their fear response to kick in. Many puppies may cry or shake at different sounds that are foreign to them, and may even showcase this behavior when being picked up. No need to worry, the majority will grow out of it. Even though they are scared it's still imperative, they get socialized and exposed to as many positive hands-on experiences as possible. This builds a more confident dog in the long run. Usually, the mother starts weaning her babies at this age; however, they are still nursing as well as learning a lot from her. By now they have begun to learn how to eat dry kibble, so we start adding high quality powdered puppy vitamins (NuVet) to there kibble. It makes a difference in their long-term health. This age is where the fun begins. Most puppies at this age become brave and comfortable with typical household noises. They can stand, walk, run, & better yet, even growl and bark. They love to play with toys, kids, wrestle each other, give kisses, and act as your very own shadow. At this point is when they want to explore outside of the whelping box. Once this happens, we start putting them in a playpen for up to 4-6 hrs a day to play with each other and my five children. At nap time and nighttime, they are placed back into their nursery kennel to sleep. Some puppies may still be very shy towards new situations just as human children can be and that’s normal. It’s important to have patience and keep trying. Eventually, they will come around. Puppies start to cut teeth at about five weeks of age; we give them hooves to practice chewing on. 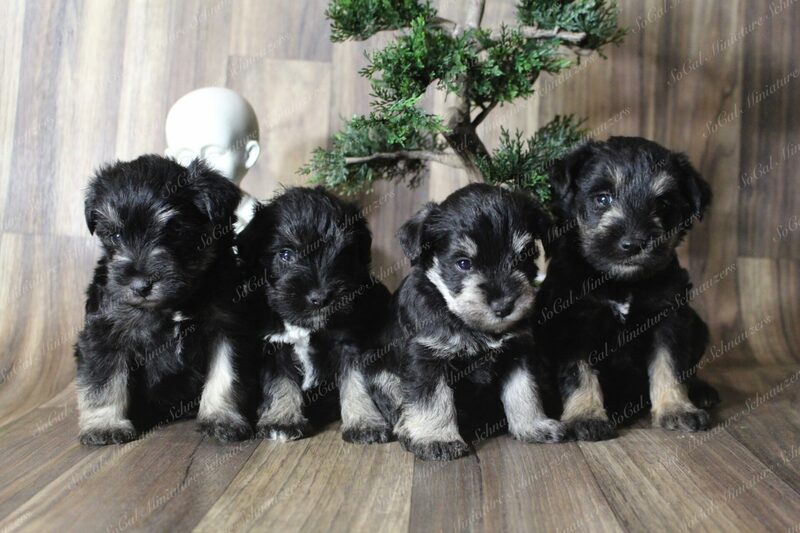 By six weeks our puppies usually have a full set of teeth and are eating dry kibble. By eight weeks of age, they are no longer nursing. They are entirely on a dry kibble diet (PawTree), and ready to go there forever homes.